Located in Manhattan, Kansas, USA, the IGP Institute was the first professional institute of its kind in the United States, providing technical training to current industry professionals in support of market development activities for U.S. grains and oilseeds. Program course offerings are led by K-State faculty and industry professionals in the areas of flour milling and grain processing; grain marketing and risk management; and feed manufacturing and grain management. Along with on-campus trainings, K-State faculty travel abroad to lead customized, on-location workshops. In addition, the IGP Institute administers virtual distance education courses for those who seek continued education in their industry but are unable to travel for on-site training. Through training opportunities provided by the IGP Institute, international business leaders, government representatives and other international participants learn more about current trends and issues affecting the grain and oilseed industries. They also develop technical knowledge and skills in these areas, allowing them to be more informed purchasers and processors of U.S. grains and oilseeds. By partnering with organizations such as the U.S. Grains Council; U.S. Soybean Export Council; U.S. Wheat Associates; Kansas Wheat, Corn, Grain Sorghum and Soybean commissions; U.S. Department of Agriculture (USDA); Grain Elevator and Processing Society (GEAPS); American Feed Industry Association (AFIA); and the International Association of Operative Millers (IAOM), the IGP Institute ensures a premier education in foreign agricultural services. As a result, IGP-trained buyers of grain, millers of wheat and manufacturers of animal feed can now be found in literally every corner of the world. To expand its services for international training programs and for students enrolled in K-State’s College of Agriculture, the IGP Institute dedicated a new, 16-acre Grain Science Complex on the northern edge of K-State’s Manhattan campus in 2004. The complex is currently home to the IGP Institute Conference Center, Hal Ross Flour Mill, O.H. Kruse Feed Technology Innovation Center, and the Bioprocessing and Industrial Value Added Products Innovation Center. On K-State’s main campus, the Department of Grain Science and Industry utilizes educational resources at Shellenberger Hall, Throckmorton Plant Sciences Center, and Waters Hall Annex. In Shellenberger, students have access to hands-on learning experiences in the Bakery Laboratory, the Cereal Chemistry Laboratory and the Flour Milling Teaching Laboratory. In Throckmorton, student research is performed in the Wheat Quality Research Laboratory. In Waters, educational experiences are afforded in the Flour & Dough Testing Laboratory, the Grain and Feed Microbiology & Toxicology Laboratory, the Micro-beam Molecular Spectroscopy Laboratory, and the Physical Properties Laboratory. Through these facilities, K-State has sealed its position as a global leader in food science research and milling best practices. In 2006, the complex completed its $12 million construction of the Hal Ross Flour Mill. The 22,000-square-foot facility is a five-story, small-scale grain milling operation intended to allow K-State students to gain applied knowledge and skills in the art of milling, and for international training programs to reinforce the continued learning of those currently working in milling industries. As part of the project, Vortex gifted $85,000 worth of valves to the Hal Ross Flour Mill to further improve the hands-on learning experiences of future millers. In 2011, Vortex donated six more valves to the facility, valued at $4,000. Other equipment for both the Hal Ross Flour Mill and the OH Kruse Feed Technology Innovation Center was provided by Bühler, Bunting Magnetics, Great Western Manufacturing, Hayes & Stolz Industrial Manufacturing Company, InterSystems, Kice Industries, REPCO, Wenger, and others. Under the observation of faculty and facility administration, the Hal Ross Flour Mill is fully operated by K-State students and international program trainees. 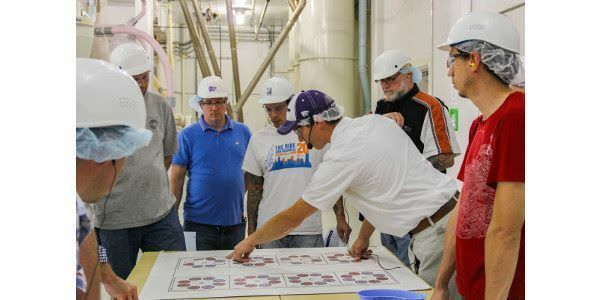 It has even been incorporated into the K-State curriculum, as several required courses for the Bachelor of Science in milling science and management program are administered using the mill’s facilities. The career outlook for students seeking such degrees is quite promising. Because K-State’s bachelor’s degree in milling science and management is the only undergraduate degree of its kind in the United States, students are realizing a 100 percent placement rate into milling careers immediately upon graduation. Recent statistics also indicate an average starting salary for millers is approximately $68,000. The Hal Ross Flour Mill is equipped to produce more than 29,000 pounds (13,000 kilograms) of flour per day. Through generous grain donations from Kansas harvesting operations, the mill’s administration is able to teach students the importance of milling in its entirety — from grain hull to end product. Once the grain has been milled as final product, it is packaged in bulk and sold through various outlets. Small quantities of product are kept on hand and donated to the K-State Milling Science Club. The club supports fundraising efforts by selling its flour and pancake mix at K-State’s Call Hall Dairy Bar. Construction of the $17 million O.H. Kruse Feed Technology Innovation Center was completed in 2013. Standing twice as tall as the Hal Ross Flour Mill, the 142-foot O.H. Kruse Feed Technology Innovation Center is a small-scale feed milling operation for K-State students studying feed science and animal science to gain feed experience in a controlled setting, and for international training programs to host IGP short courses and seminars. The O.H. Kruse Feed Technology Innovation Center features a California Pellet Mill (CPM) pelleting system with the capacity to produce one ton of pellet per hour. The center also includes facilities for grain and ingredient receiving, handling, and storage, allowing the mill’s operators to observe all facets of the feed milling process. In total, the O.H. Kruse Feed Technology Innovation Center is capable of producing five tons of fully processed animal feed per hour. Once the feed has been processed for safe animal consumption, it is packaged in bulk and donated to K-State’s Animal Science Research and Extension program, where the feed is used to supplement the nutrition of university animals. Through this program, K-State furthers research and community knowledge on beef, dairy, equine, value-added foods, meat, food safety, poultry, sheep, goat, swine, veterinary, antibiotics, wildlife, livestock and more. Providing students with an additional facet of knowledge, the Cargill Center for Feed Safety Research at the O.H. Kruse Feed Technology Innovation Center allows students and faculty to perform investigative research in areas such as grain genetics, energy efficiency, feed quality, nutritional performance, feed grinding, specialty feed mixing, grain storage, feed quality preservation, pet food research and more. Also through this facility, faculty and students intentionally contaminate samples of animal feed with live pathogens, supporting research on how to sterilize and decontaminate food before it is fed to animals. The Bioprocessing & Industrial Value Added Products Innovation Center at Kansas State University is a 33,000-square-foot, state-of-the-art research facility that houses the Bio-Materials and Technology Laboratory, the Extrusion Pilot Facility and Laboratory, and the Bioprocessing and Renewable Energy Laboratory. The goal of BIVAP is to make contributions toward reducing climate change, enhancing energy security, aiding worldwide hunger relief, and bettering sustainability initiatives. In support of these studies, BIVAP is developing innovative technologies to produce value-added, bio-based products from grains and other agricultural inputs. With these core values in mind, the purpose of BIVAP is to assist businesses, entrepreneurs, investors and university faculty in the development of new, commercialized bio-based technologies. Possessing conference rooms, three areas for pilot-scale processing, six areas for bench-top research and testing, and expert knowledge in the areas of bioprocessing, extrusion and fermentation, the facilities at BIVAP are essential to bringing ideas from concept to development to commercialized fruition. Further complementing K-State’s commitment to continuing education is the Kansas State University Bulk Solids Innovation Center. Located in Salina, Kansas, USA, the nearly 13,000-square-foot research facility is used to study and further the understanding of bulk solids materials handling. Features of the facility include six flexible bulk solids laboratories; office space for researchers; a training room equipped to accommodate 56 students; a storage silo; a blower and motor control room; and a conference center. The largest laboratory space is a full-scale, 30-foot-tall open bay, which allows more exploratory research into bulk solids storage, conveying, gravity flow, blending, segregation, degradation, dust collection, safety and air pollution control. Such a space enhances the collaborative research experiences of university investigators, students and academic fellows interested in the advanced science of bulk solids material handling. The center also hosts professional development courses, allowing business visitors to tour the facilities and network with industry experts to discuss cutting edge developments in bulk solids material handling. With major businesses from all over the world traveling to attend such courses, the goal of K-State’s Bulk Solids Innovation Center is to enhance businesses’ understanding of bulk solid materials and the systems that convey, store and dispense them for manufacture. Construction of this university-level research center in 2015 was highly anticipated, as it is the only one of its kind in North America. Kansas State University’s research is supplemented by Coperion (K-Tron) and Vortex, which provide the center’s mechanical components for bulk material handling. “The science of dry bulk solids handling is complex due to the variation in properties of different components in the mixture,” said Johnselvakumar Lawrence, Ph.D., research director at the K-State Bulk Solids Innovation Center. “Many different factors affect bulk solids material behavior, including particle size, distribution, shape, permeability, cohesion, hygroscopicity, friability and others. Common bulk solids handling issues are rat holing, caking, bridging, flooding, segregation and erratic flow.